SEGA Networks (mobile operating division of SEGA) partnered with Sensor Tower this year to present the 2016 Mobile Gaming Trends Report. 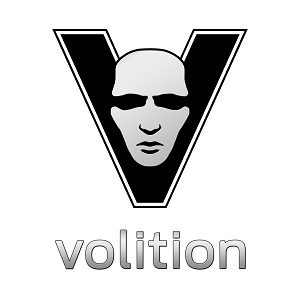 The report covers the overall and category-focused mobile gaming industry trends. You can access the full report contents for free from the website here: www.mobilegamingtrends.com. This post covers some of the key take-aways from the 2016 Mobile Gaming Trends report. The analysis was conducted by studying the universe of mobile games in 2016 that generated at least $250K in net IAP revenue in a single calendar month on both iOS and Google Play. We further segmented the games into categories based on a mobile gaming industry taxonomy which I posted about here: An Open-Source Mobile Gaming Taxonomy. 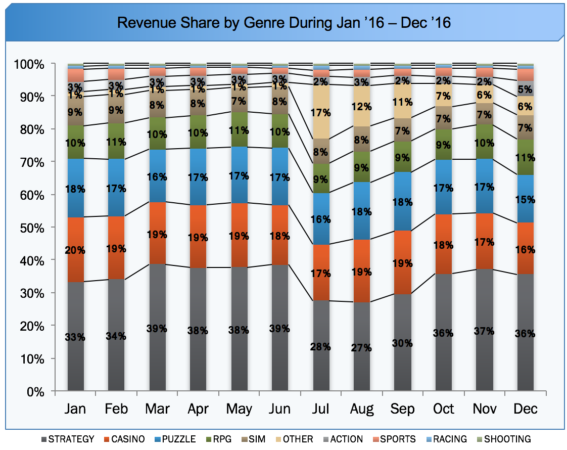 Strategy (34%), Casino (18%), and Puzzle (17%) comprised the top 3 mobile gaming categories by market share based on net revenue. See blue yellow and green categories below. The launch of Pokemon GO (in the Other category) saw the game steal significant market share from the Strategy category (drop from 39% to 28%) when it launched in July of 2016. 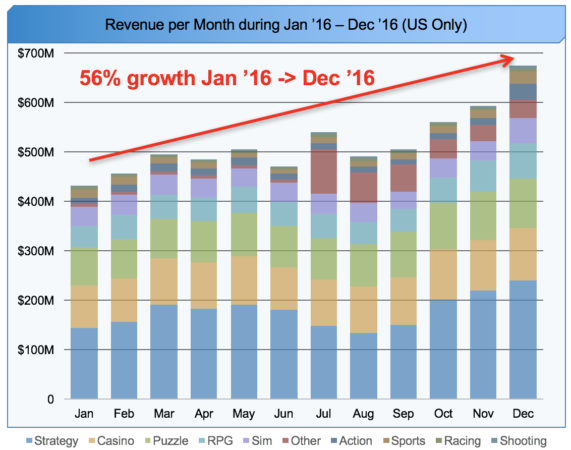 However, strategy recovered by the end of the year (up to 36%) and Pokemon GO saw a fairly sharp decline in revenue from July through December of 2016.
iOS generated the majority of IAP revenue despite having much less market share. Statista reports that iOS only held 19% share of worldwide mobile OS installed base compared to Android with 79% share. Unfortunately, I did not find good U.S. market share numbers. 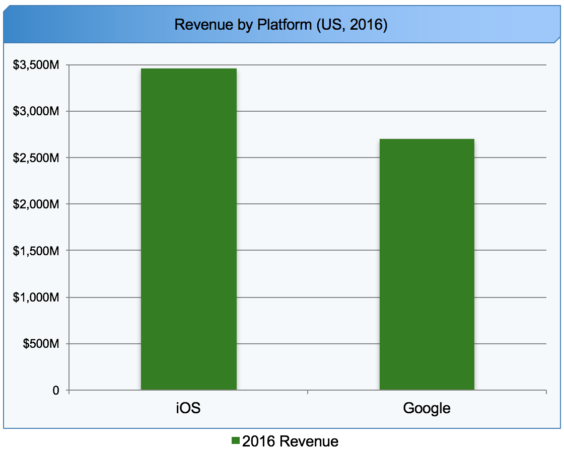 iOS accounted for $3.5B (56%) in net revenue compared with $2.7B (44%) for Google Play (again, for mobile games that qualified for our study). 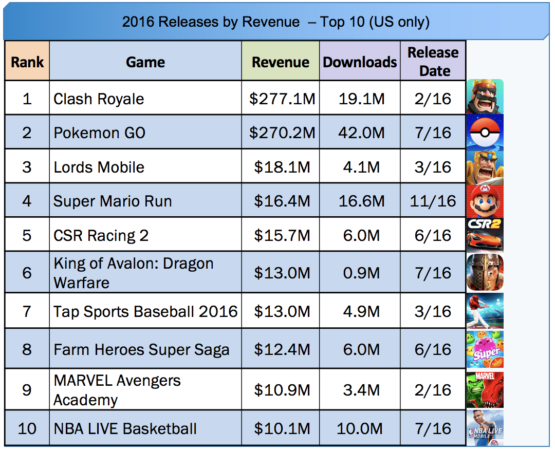 Clash Royale, Pokemon GO, and Lords Mobile comprised the top 3 mobile game launches of 2016 by revenue. Pokemon GO accounted for 37% of the downloads of all of the Top 10 for 2016. Finally, 7 of the top 10 games were either Licensed IP or Expansion Game IPs showing the importance of brand/IP to game success in that year. 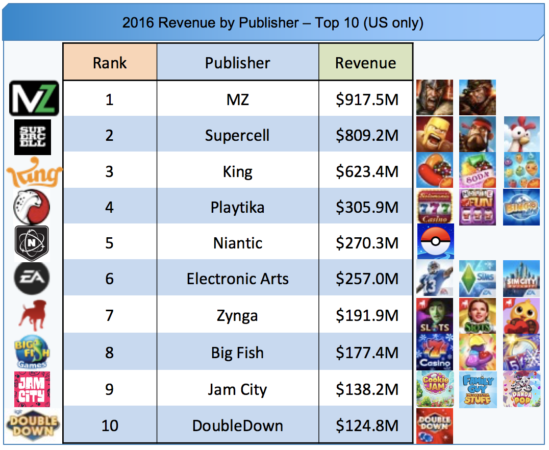 MZ became the #1 US mobile game publisher in 2016. 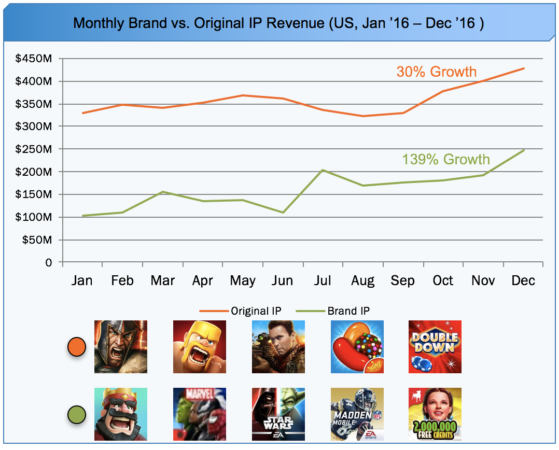 Both Game of War and Mobile Strike (released in late 2015) contributed to MZ's success. Further, Game of War became the #1 grossing game (generating $518.5M in 2016 US revenue). Original IP games (63% of total revenue in Dec ‘16) continue to dominate the mobile gaming market relative to Branded IP based games (37% in Dec ’16). However, Branded IP games (139% growth) are growing much more strongly than Original IP based games (30% growth). The Top 200 grossing titles for 2016 in the US generated an estimated $6.6B of revenue in 2016. 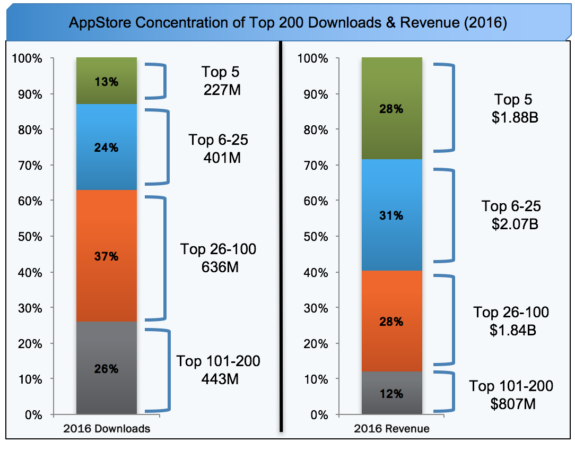 The top 5 Titles represented a full 28% of revenue amongst the top 200 despite only comprising 13% of the downloads. The #1 game in the U.S., made an estimated average of $43.2M / Mo. 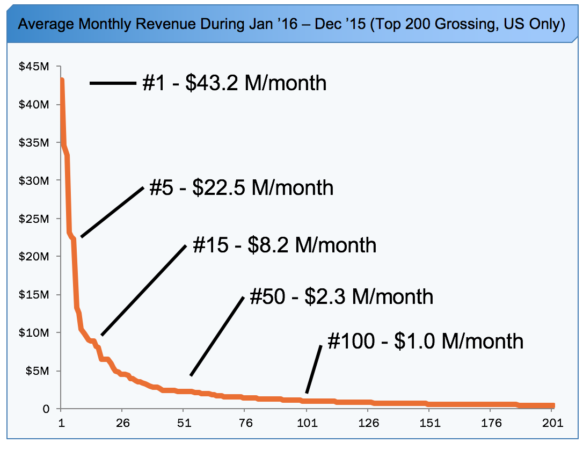 in net revenue in 2016 (U.S. only) compared to only $1.0M / Mo. for the #100 spot. This report further breaks down each mobile gaming category and sub-category for trends. The top games in each category are also noted. For much more detailed information, please check out the report here: www.mobilegamingtrends.com.